Hello and welcome again to our monthly Style Not Age challenge! This month Hilda came up with "Keen As Mustard" as our quest and it seems to have been a breeze if I may say so myself. The shops and adverts are brimming with ideas for this lovely warm shade of yellow. Personally, I love mustard as it works well with my skin and hair tone. I'll give you all the details of my outfit anon, but first let's see what the gang came up with shall we? Hilda is all wrapped up in her oversized mustard scarf which looks toasty warm. Hat and gloves complete the essentials for the cold snap too. I have to mention how clever her photographer was to line up this shot with the golden foliage behind as it matches perfectly! Read Hilda's feature on her blog Over The Hilda. 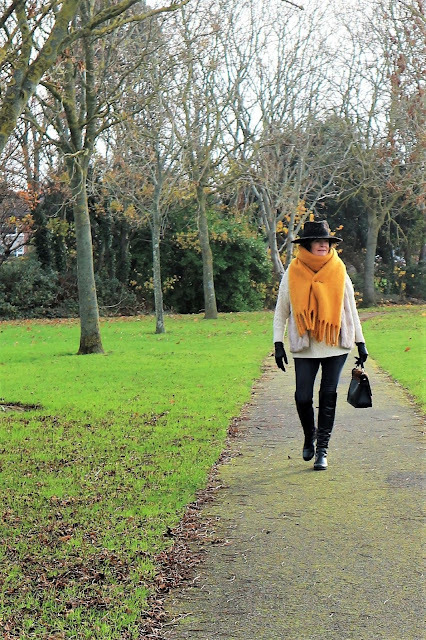 Emma from The Style Splash has chosen lots of nature's colours to compliment her mustard top and courts. I could do this, yes I really could, and by that I mean that I too have camo jeans like these and a green suede jacket almost identical to Emma's! Click here to read her style story. 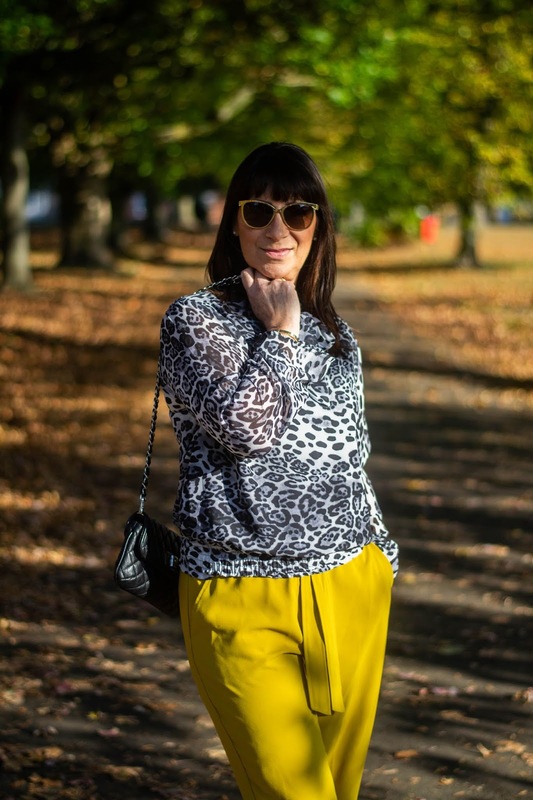 Jacqui and I had similar inspiration with this challenge, pairing mustard with animal print to great effect. I'm intrigued to see what footwear she chose - race you across to Mummabstylish blog to find out! My own style story began with this new jacket which I bought in the Topshop sale recently (all sold out, sorry). I'm a sucker for these denim/jeans jackets at any time, but when you throw checks into the mix I'm a hopeless cause. It was the last one, but again that's so often the case with me. I wonder if they see me coming and stash all of the others away to induce a sense of panic in me? No matter, I love it and can see it will be a long term fave. The black polo neck was one of three essentials that I bought last year in Primark, the others being grey and cream. These flower strewn trousers are by Massimo Fabbro Italy, bought in TK Maxx last year. The masculine cut sits really nicely, skimming over the thighs rather than clinging in the wrong places. The fabric is man-made, a heavy drape and seems to be pretty crease resistant too. I've had these pony skin, animal print ankle boots for years. The brand is Bertie, the quality is top notch and I'm sure they'll go on for a long time yet. I bought this cute little bag in Rome when we were there a few years ago. It's just big enough to fit in a lipstick, hairbrush and purse - what more does a girl need? The rings are pre-loved which is a relief as I hate to appear totally extravagant, hahaha! It made a nice change for me to go full out with my pattern play - it seems to be ages since I've mixed things up like this. On paper, checks, florals and animal print may not seem to be happy bedfellows, but hey I think I've proved that they are! And finally, I'm going to blame the mid-day sun for highlighting my recent decrepitude aka the jowls that I've not noticed before. I think I've always tried to hide this gradual decline by sporting a huge grin which acts as scaffolding for the face. Note to self - more smiling equals less jowls. Well, that's it for another month. I do hope you'll take a moment to visit my co-conspirators for the full write-ups from them. I'll be back soon with another dose of colour to chase the winter blues away. Until then, I wish you all a super week ahead! woww, what a fabulous ensemble!, love your plaid jacket (such an interesting print on a denim jacket! ), love the floral pants with the animal print booties!, and love the matchy-mixed patterns! absolutely stunning! brilliant!! I must admit, this was a very inspiring challenge for me Monica. The minute I started searching for mustard pieces I found so many shades that could have worked here. I'm glad you appreciate the pattern play - it's great fun isn't it? So many beautiful mustard pieces! You all show that mustard really goes with anything and can be styled so many ways! I love your outfit and the pattern mixing you did! And how perfect are that little bag and the gorgeous boots with it! Very well done! Hello sweetie, great to see you again! This challenge really did bring out the best in all of us I swear. And yes, I was delighted to discover this long forgotten bag too! Thanks for dropping by Andrea. The mix of prints works so well Anna! I love your jacket, and the animal print boots really compliment the outfit. Cheers Emma. I'd love to do a style steal of your outfit - I just need to find a mustard top. What fun! Most of the time I just have to shop my closet when these challenges come up, so it was a great excuse to bring out this newly purchased jacket as my starting point. And golly, yes I do seem to have a lot of mustard in my wardrobe. Cheers Ann - I did love this challenge too! Anna you nailed it. I love any pattern mixing and as for those boots..swoon! Thanks Hilda, for a fabulous challenge. I felt right at home with this one. And the boots, I'd completely forgotten about them, so thanks for that! Your pattern mixing here is kind of thrilling! It all goes together pretty seamlessly. Don't you love it when you can pull off such a great pattern mix? Mustard is not a color I wear all that well but this year I just had to add a mustard sweater/ jumper to my wardrobe. Pairing it with a cobalt scarf has made it work! Oh goodness Jude, I really did have fun with this one. The pattern play is always a bit of an adventure and this time it worked out pretty seamlessly as you say. Thanks for the tip about cobalt with mustard - I would never have thought to put those two together! Your jacket is fantastic! Really amazing. And of course you styled it so creative! Wonderfull! Thanks so much Nancy. I can't wait for next spring when I can bring this jacket out again and have more fun with it. Cheers Jacqui. This was no hardship, just lots of fun as far as I was concerned, so really an absolute gift in my book! Roll on December! I love all these patterns and colours together, Anna! They look awesome. I adore that jacket - I never see plaid jackets here (unless they are super-shoulder-padded 80s blazers). This is the first jacket of this kind I've seen too, hence my need to buy it! We've got a huge plaid/tartan trend going on here and this brand is always a trendsetter - I'm delighted with this! A lovely mix of pattern and colour and the plaid jacket is fab! It can go with your one legged plaid trousers, too! I love your floral trousers; I find a floral trouser hard to resist. The boots are lovely classics and quality indeed. Tartan and plaid are planning a takeover in my wardrobe currently and I'm not putting up too much of a fight Vronni. I have placed said jacket and jeans together with red tartan boots, but it was way too much! Anna, you don't do anything half-heartedly do you? Smashing the pattern mixing and mustard showcasing in one stylish swoop! I love seeing you in full flow. Cheers for that Samantha. Sometimes things just seem to come together as if by magic and that's how this challenge went. I'm rarely in print and I think you're wearing my quota for the season in one outfit, and so beautifully too! I'm sure you were as keen as mustard to get this colourful combo together. Hugs my sweet, x. Isn't it funny how different we all are Mary? Pattern play is one of my passions - I just love to keep challenging myself to see what new ideas I can come up with!